Park Heights 2 is a twin-tower 18-storey residential complex being developed by Emaar Properties and Meeras in Dubai Hills Estate. 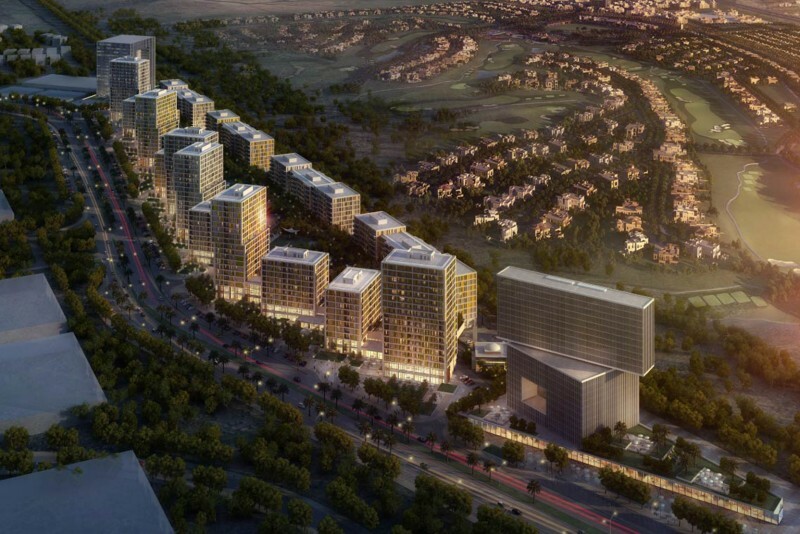 The development, located on Dubai Hills Boulevard directly adjacent to Park Heights 1, was launched in May 2017 and is expected to be handed over in March 2020. The buildings promise to offer ‘luxury yet affordable’ one- to three-bedroom apartments with panoramic views of the Downtown skyline and the gardens of Dubai Hills Estate Park. The one-bedroom apartments range in size from 54.2sq m with balconies of 5.85sq m, totalling 60.05sq m (583.4sq ft + 62.97sq ft = 646.37sq ft), to 57.72sq m + 24.05sq m = 81.77sq m (621.29sq ft + 258.87sq ft = 880.16sq ft). The two-bedroom apartments range in size from 83.42sq m with balconies of 5.85sq m, totalling 89.27sq m (897.93sq ft + 62.97sq ft = 960.9sq ft), to 83.29sq m + 37.32sq m = 120.61sq m (896.53sq ft + 401.71sq ft = 1298.24sq ft). The three-bedroom apartments are all more or less the same size at around 132.3sq m with balconies of 17sq m, totalling 149.3sq m (1424sq ft + 183sq ft = 1607sq ft). Driving times are estimated by the developer to be: to Burj Khalifa Estate, 10 minutes; to The Dubai Mall, 10 minutes; to Dubai Marina, 10 minutes; to Jumeirah Beach, 12 minutes; to The Tower at Dubai Creek Harbour, 15 minutes; to Al Maktoum Airport, 35 minutes; and to Dubai International Airport, 20 minutes. One-click links to properties currently on the market in Park Heights 2.